You might think you know Robert Rauschenberg (1925–2008), but wait until you see the show at Tate Modern. 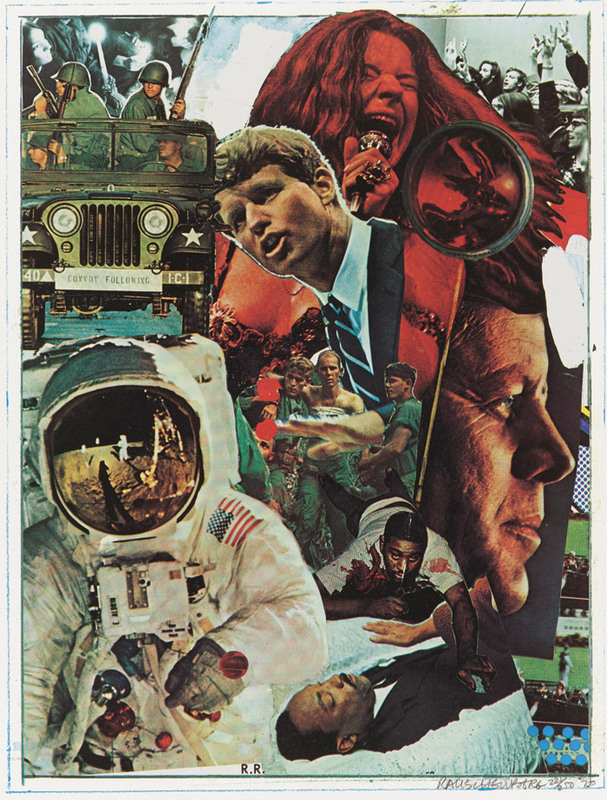 He may be most famous for his Combines - exuberant collages of found detritus, from newsprint and cardboard to stuffed animals - and his definitive, Pop Art icons, those silkscreened collages. But what comes across most vividly in this celebratory, kaleidoscopic exhibition is that, during his six-decade career, he seems to have predicted and laid the foundations for almost every contemporary art movement that followed. As Tate Modern’s director of exhibitions, Achim Borchardt-Hume, said at the press view: ‘Without Rauschenberg’s made Bed (1955), we would never have had Tracey Emin’s unmade My Bed.’ And the gritty, greasy reality of this work - the handmade quilt, stapled to the canvas, its edges tucked around a rumpled sheet and pillow; and then daubed vigorously with gobbets of oil paint, defaced with pencil scribblings - does indeed stand out as a flag for the kind of confessional, in-your-face aesthetic of bravado that has become all too familiar. The vividness of his ideas and verve of his execution spawned so many artistic responses, not least that of John Cage, whose silent (but for the ambient noise) composition 4’33” was said to be directly inspired by Rauschenberg’s White Painting (1951) shown here - seven panels covered in white house paint, applied with a roller, deliberately avoiding incident or gesture, it is pure surface - expressing his view that art is a mirror for capturing the world outside. Rauschenberg never intended to be an artist. Christened Milton Ernest Rauschenberg (he came up with the name Robert after an all-night brainstorm in a coffee shop), he grew up in Texas, the son of two fundamentalist Christians and even embraced the idea of becoming a preacher - a course he abandoned when he realised he’d have to relinquish his passion for dancing. It feels as if the narrow confines of that very stark, black-and-white world of religious absolutes might have been what compelled him - once he discovered that you could choose art as a career - to pour every ounce of curiosity and inventiveness he possessed into a constant expanding of boundaries. He had a talent for science but got chucked off a pharmaceutical course for refusing to dissect a frog. He ended up being drafted into the navy, becoming a technician in the Hospital Corps after refusing to take part in any killing. Though he drew prodigiously, his art epiphany came when he visited the Huntington Library in California (viewing Gainsborough’s Boy Blue and Thomas Lawrence’s Pinkie, in all their vivid sensuality, but recognising them from an earlier incarnation as pictures on the backs of playing cards). This prompted him to take advantage of the GI Bill, after the war, and study at the Académie Julian in Paris. Here he met the artist who was briefly his wife, Susan Weil, with whom he had one son, Christopher. She had enrolled in the Black Mountain, experimental, anti-hierarchical art course in North Carolina, run by Josef Albers - Bauhaus professor and refugee from Nazi oppression. Albers, with his rigorous approach to colour and composition, had a massive influence on Rauschenberg, teaching him about contrast and tension, about relational art, but also perhaps as a counterpoint - where Albers’ work sought order, Rauschenberg’s muse was chaos. Nothing was sacred and everything was possible in Rauschenberg’s world, including his collaborations with choreographer Merce Cunningham, another Black Mountain alumnus, which spawned a professional dialogue that lasted one intensely fruitful decade. Rauschenberg travelled all over the world with Cunningham and his dancers - an experience which exposed him to the intoxicating idea that art didn’t have to be confined to museums and galleries, it could be performed anywhere. He invented sets, backdrops, costumes, props that could be carted from venue to venue, often improvising on the spot, and even danced himself (on roller skates, pulling a parachute). Just on the basis of the few grainy, analogue videos we see in this show, it feels as if these collaborations marked a high point in the field of contemporary dance, as stunning experiments in colour, form and gesture. Robert Hughes called him ‘the artist of American democracy… yearningly faithful to its clamour, its contradictions, its hope and its enormous demotic freedom.’ He certainly embraced or experimented with every art form, every material, every mood and mode of expression, from minimalism to maximalism. 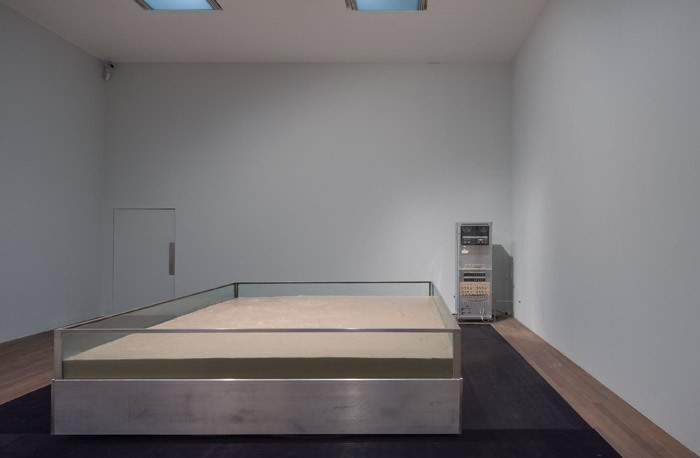 The first room in this Tate show - which is a collaboration with New York’s Museum of Modern Art, though the Tate gets it first - sets the tone, really, showing us the breadth and energy of his vision even at the beginning. 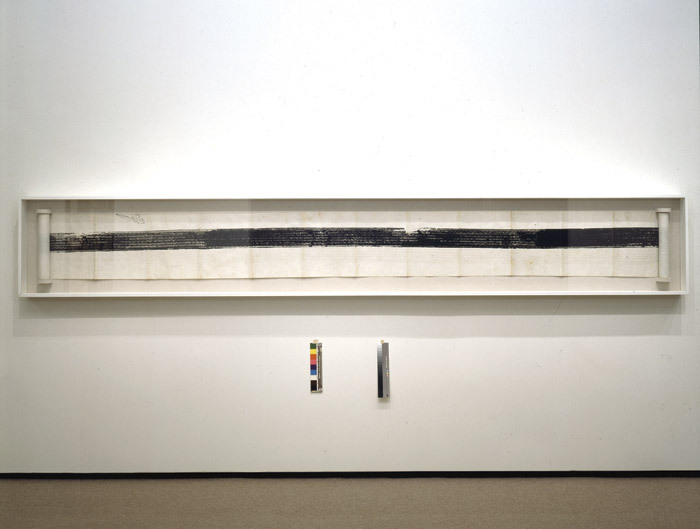 We see early photograms, an Untitled (Black Painting) of 1951 - gallons of oily black enamel slicked over scrunched up newspaper - the aforementioned White Painting (1951), and an Automobile Tire Print (1953) - literally a car tyre driven over several sheets of glued together paper - which could be a precursor of 70s performance art, Yves Klein’s body painting or Richard Long’s journey markings. As we progress through the show, we see paintings made of mud (painted gold), we see a rich assortment of his Combines, including the iconic Monogram (1955–59) incorporating a paint-daubed goat, wearing a car tyre as a corset, and the aforementioned Bed. There are photographs, sculptural experiments, notebooks, drawings, a room dedicated to his ghostly illustrations for Dante’s Inferno, using a technique he developed of transferring magazine images onto paper by applying lighter fluid to them and then rubbing an empty ballpoint onto the back. The silkscreens were his breakthrough medium, giving him his first major retrospective in 1963, at New York’s Jewish Museum, and then the Whitechapel Gallery in London. But as soon as he was awarded the accolade of the painting prize at the Venice Biennale in 1964 - the first American to receive the honour - he asked his assistants to destroy the remaining works, lest he become trapped in the cycle of endless repetition. Over the following decade he threw himself into performance, fascinated by the relations between objects and actions.He established his own dance company with choreographer Trisha Brown, and experimented with sculptures made from scrap-metal parts and wireless microphone systems that could be reconfigured. He even set up a non-profit foundation, called Experiments in Art and Technology (EAT), to promote interaction between engineers, artists and industry, and within three years had 2,000 engineers signed up as well as 2,000 artists. Though the fruits of that particular collaboration remain obscure, the Tate show does feature some engaging, fairly analogue, Heath Robinson-esque contraptions, as well as the Mud Muse (1968–71), a large metal tank containing 1,000 gallons of liquid mud which spurts and bubbles as air is pumped into the mixture in response to its own soundtrack. In the Eighties and Nineties, he retreated to a more tranquil kind of lifestyle, exploring a calmer form of abstraction in his work inspired by his travels to India, and his new home, an island off the coast of Florida. But he returned to photography in his last decade, incorporating inkjet printers in place of silkscreen to create huge, collaged tapestries of images drawn from his travels and clippings, a tribute to his unending curiosity. And it’s these that finish the show - the last work by the exit neatly throwing up an image of tyre tracks in the sand to resonate with the tyre track on paper that kicked off room 1 by the entrance. When it comes to making tracks, Rauschenberg’s have clearly travelled further, ranged wider, and lasted longer than most.